A sending state user can create a new Transfer Request based on a rejected Transfer Request after the receiving state withdraws an approved Transfer Request Reply. REMINDER: Withdrawing an approved transfer request reply changes the status of a compact case from approved to rejected. Multiple county offenses appear on the Transfer Request PDF. If applicable, provide gang affiliation information when adding/editing offender information on a Transfer Request or a Request for Reporting Instructions. Only State Administrators can delete or change gang affiliation information. Violations from withdrawn violation reports do not appear in the “previous violations” section on subsequent Violation Report PDFs. Duplicate Offenders List: Identifies possible duplicate offender records for deletion or merge. 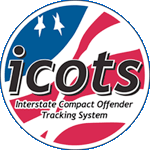 Pending Merges and Deletions of Offenders: Provides status for merge and delete requests created by other states and awaiting action by your state. Resubmit a new Transfer Request.